The scuffle between gay rights campaigners and homophobes has had dozens people detained in central Moscow. The Russian human rights activists are concerned. 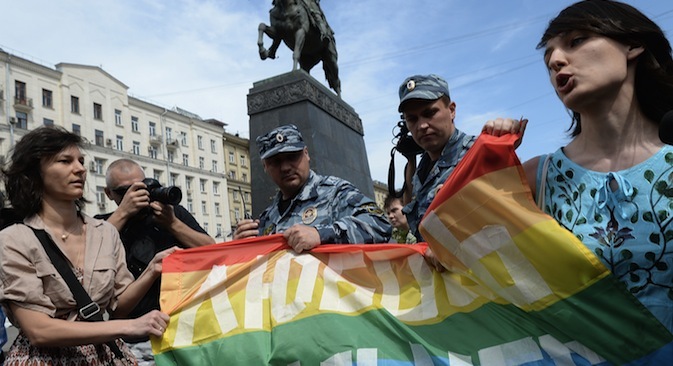 With dozens people detained during at a gay rights parade in the central Moscow, Russian human rights activists expresses their concerns about human rights record in Russia. Gay rights activists came to blows with homophobes in Moscow's so-called "Hyde Park" protest site on Saturday, with about 15 people being detained by police, a spokesman for the city police authority said. All the detainees were taken to police stations, the spokesman told Interfax. The "Hyde Park" protets sites are an area near Moscow's Gorky Park. There were other arrests on Saturday during an abortive gay rights parade in the central Moscow that had not been permitted by the city administration. "About 30 followers and opponents of the lesbian-gay-bisexual-transgender [LGBT] movement have been detained in the city center for various violations of public order, including an attempt to hold an unsanctioned event," a spokesman for the city police authority told Interfax. The detainees included the leader of Russia's LGBT movement, Nikolai Alexeyev. Alexeyev came out onto Tverskaya Square, opposite the mayor's office, but was led away by police as soon as he started talking to reporters. Meanwhile, a veteran Russian human rights defender condemned the dispersal by police of a gay rights parade in the center of Moscow on Saturday. "We are plunging into something like the Middle Ages," Lyudmila Alexeyeva, head of Russia's oldest human rights organization, the Moscow Helsinki Group, told Interfax. "In Ukraine, which had been part of the same state as us until quite recently and its road to democracy hasn't been longer than ours, there has also been a gay parade," she said. "But there the police defended the parade participants against those who were angry with it so that nobody should prevent the right to processions, rallies and demonstrations from being exercised," Alexeyeva added. "Thereby Ukraine has shown itself to be, if not a democratic country, then a country that is seeking democracy." The Moscow parade had not been permitted by the city administration.